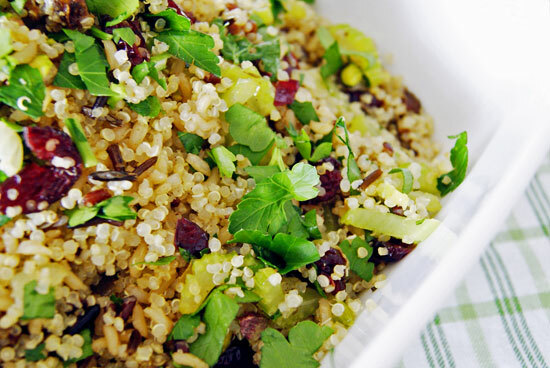 Wild rice and quinoa – what a fabulous combination. Looking for healthy alternatives to the usual bread based stuffings? Why not try a rice or quinoa stuffing? Or better still, combine the two. I find breadcrumb stuffings a bit on the heavy side – particularly when combined with a large meal of roast turkey, vegetables and then dessert. You start to feel a bit like the turkey – completely stuffed. Solution – stuffing made with quinoa. You can still use the same ingredients such as dried fruit and nuts. The only thing that changes is the cooking method. For added flavour try cooking the rice or quinoa in vegetable or chicken stock then adding plenty of dried fruit and herbs. Heat the oil in a large saucepan over a medium heat. Add the chopped onions and celery and cook, stirring occasionally until they are soft. This will take about 5 minutes. Add the apples and garlic. Whether you peel the apples or leave them unpeeled is a matter of personal preference. I personally think that the skins add a bit of color and crunch to the dish. Add the chicken stock and bring to the boil. Add the rice (I used a wild rice blend) and give a stir. Cover the rice, reduce the heat to medium-low and leave to simmer until the rice is tender, about 35 minutes. Stir in the quinoa, replace the lid and continue cooking for about 15 minutes or until the quinoa is tender. Stir in the cranberries, dates, pistachios, thyme and parsley. Preheat the oven to 180°C / 350°F. Spray a large casserole dish with non-stick cooking spray. Lightly spoon the rice mixture into a large casserole dish. To keep the mixture light and fluffy don’t squash it down. Bake for about 25 – 30 minutes or until a golden brown. To serve sprinkle with a little more chopped fresh parsley. Rinse the quinoa in a fine-mesh sieve under cold running water until the water runs clear. Place the vegetable stock in a large saucepan and bring to the boil. Add the quinoa and reduce the heat to low. Cover the pan and leave to simmer until the quinoa absorbs the liquid. This will take about 12 minutes. (Check your quinoa a few minutes beforehand to make sure it doesn’t burn). Remove from the heat. Heat the olive oil in a large heavy-based frying pan over medium heat. Add the butternut squash and celery and cook until slightly browned. This will take about 10 minutes. Stir the quinoa into the vegetables and gently mix through the green onions, apricots, cranberries, pecans, herbs and chopped parsley. Give the mixture a good stir to combine all the ingredients.